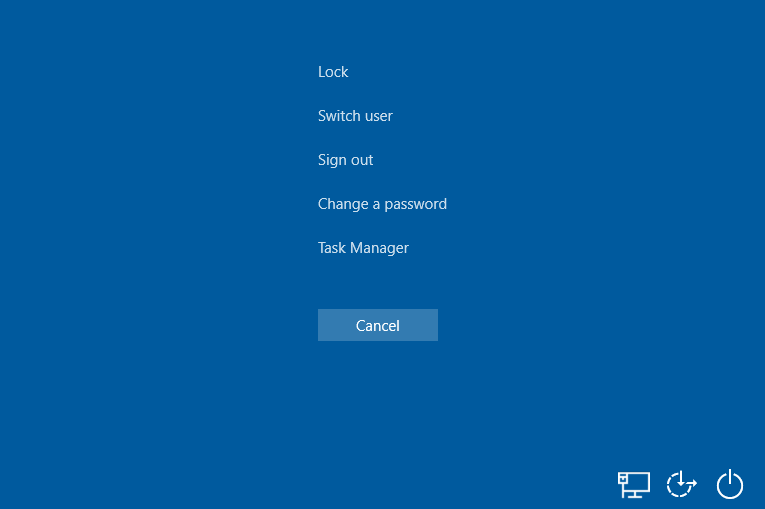 Windows operating system supports Fast User Switching feature that allows multiple users to sign in to the PC and switch between user accounts easily. One does not need to log out or close all the apps and files before another user can log on to use the PC, and can seamlessly switch back to his or her account session to continue the unsaved works when the other user logoff. There are multiple methods of which users can switch between more than one accounts without logging out from currently logged in user account on a local PC. In Windows 10, the ways to perform switching of users have undergone slight changes and refinements when comparing with previous versions of Windows, even though the methods used in versions like Windows 7 and Windows Vista are still available. 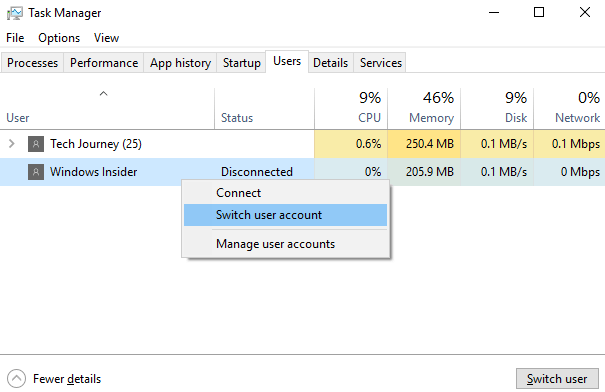 Note that if you’re connected to a remote Windows system via Remote Desktop Connection, Fast User Switching is not supported. 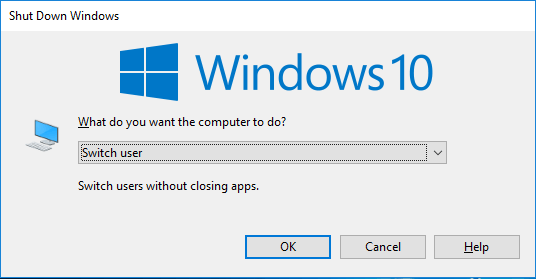 Always make sure that you save your works before switching user accounts as any unsaved changes in open files will be lost if the computer is shutdown by the other user. 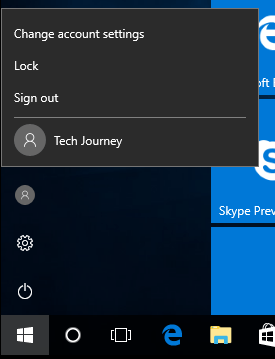 This option to switch to a different account works only if you have more than one accounts configured on the Windows 10 PC. Tap or click on the account point on the left rail of Start menu. 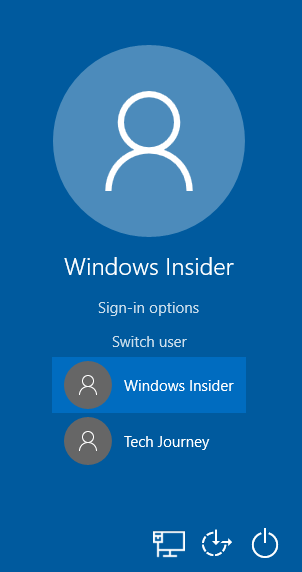 Then, click or tap on the other user account that you want to switch to (all other user accounts added on the local Windows 10 system is located below the separator line). The sign in screen of the selected user will be presented directly. Minimize all windows to make the Desktop the focused active window. Press Alt + F4 keyboard shortcut to open the “Shut Down Window” dialog. Select Switch user in the drop down menu, the click or tap OK or press Enter. 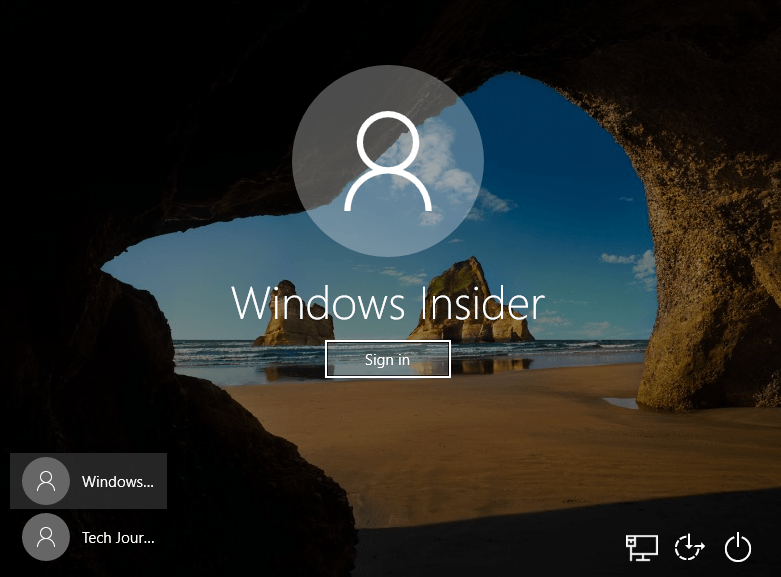 The current user is locked and Windows will display a lock screen (if the PC is joined to domain) or sign in screen). If you’re at the lock screen, press Ctrl + Alt + Del to unlock. On the bottom left corner of sign in screen, select the user that you want to switch to and sign in. Press Ctrl + Alt + Del keyboard shortcut. In the security options menu, click or tap on Switch user. tsdiscon.exe is not available in Windows 10 Home edition. Execute C:\Windows\System32\tsdiscon.exe (you can use Search, Run dialog, File Explorer, or Command Prompt to run it). The current user is instantly disconnected and locked, and lock screen is presented. Press Ctrl + Alt + Del (for domain-joined computer) or click or tap or press Enter (for non-network joined PC) on the lock screen to unlock. This option works only on previously disconnected user account, i.e. user account that you have switched out from without signing out. Click or tap on More details to expand the Task Manager for detailed tabs. Right click on the disconnected user that you want to switch to, and select Switch user account; or select the disconnected user that you want to switch to, and click or tap on the Switch user button. If you have using Picture Password, you need to click or tap on Switch user to show the user accounts available for you to switch to.